As the #1 pie in America, this crowdpleaser is aligned with your desire to keep the peace, and make sure everyone is happy. Apple Pie doesn’t assault the taste buds. It’s sweet, familial, and constant. Apple pie is ubiquitous, and seeing as the S style is the most common personality style, this fits. Apple pie doesn’t try to rock the boat, it doesn’t get in your face. It is steady and delicious no matter what. Sure, you could try to do something crazy like combine new flavors with the apples and sugar, but why would you want to do that? 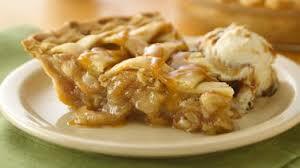 People who want apple pie don’t see why you need to go around messing with a good thing. And the S Styles would agree. What? A sour vegetable, put it in a pie?! That sounds weird. Who would’ve thought that it would be so delicious! Strawberry Rhubarb is like an I Style personality. It isn’t afraid of thinking outside the box. Like Rhubarb, I styles aren’t afraid of being uprooted. I styles embrace change! The strangeness of combining acidic vegetables with the popularity of Strawberries makes this one of the best pies in America. And we all know how much an I enjoys being popular. 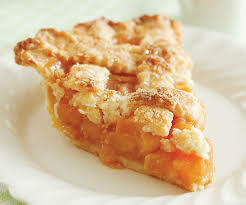 But unlike the S style Apple Pie, I’s don’t want to be popular because they’re inoffensive; they want to be popular because they’re unique. And awesome. That’s Strawberry Rhubarb. 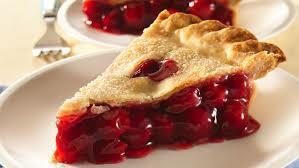 A Cherry Pie is made from sour cherries, which have a striking, assertive flavor. They pretty much take over your mouth. 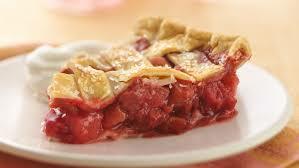 The bright red color of Cherry Pie lacks subtlety, and makes it the pie most likely to be associated with the D style personality. Big, bold flavors. Cherries aren’t neutral, bland fruits. They’re juicy and vibrant, like the D style personality. D styles know how to get the job done, and a great cherry pie is certain to please people- job done. And, since fresh sour cherries can be illusive in the grocery stores, many people opt to buy the filling in a can. A D style would approve of this decision- it’s the fastest way to get the job finished, and move on to the next task! Warrant didn’t write the song “Cherry Pie” about a bashful wallflower, no sir. Cherry Pie is bold and dominant, just like the D style personality, and they wouldn’t have it any other way. If you’ve ever baked a Peach Pie, or baked a lattice top pie, you know it isn’t easy. You can’t let the peaches release too much juice, or the crust will get soggy. You have to get your crust recipe just right to be able to fold it into the perfect lattice top.